Transport policy is an increasingly difficult area for all national governments and regional/local authorities. Tackling car use and realising a sustainable transport system appears to be very difficult. Developing public transport is seen as an increasingly important element in improving the transport system, especially in densely populated areas. At the same time however, governments are under increasing pressure to cut taxation. As a result there is a growing gap between increasing policy need for public transport and government resources to fund that need. This timely book explores one solution to this dilemma, which is the use of local charges and taxes dedicated to support public transport. 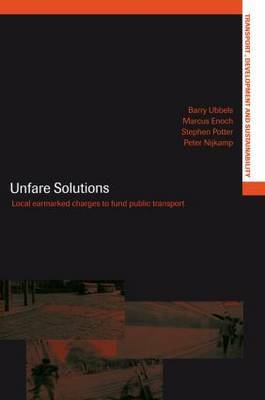 Unfare Solutions examines how and why such charges have evolved and how they do (or do not) relate to modern transport policy developments and theory. It shows innovative funding techniques developed by both public transport providers and federal and local authorities.